Summary: Primetals Technologies has already successfully introduced the Hybrid Flotation technology for beneficiation of non-ferrous metals. The increasing demand for highly enriched iron ore concentrate with low silicate and sulfide content as feed material for pelletizing systems also makes this technology very interesting for iron ore beneficiation. The company carried out a test campaign with its own Hybrid Flotation cell in the laboratory. 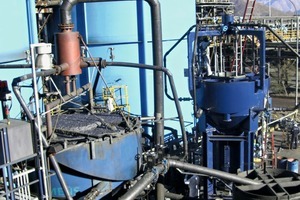 An iron ore concentrate containing 67 % Fe and 1.3 % S was used as the feed material. The target of the test campaign was to reduce the sulfur content to below 0.4 % in the final concentrate. The required iron recovery was at least 95 %. The results of the campaign show an overfulfillment of the set targets and thus confirm the potential of Hybrid Flotation technology in the application as a rougher-cleaner combination. The Hybrid Flotation technology was able to produce a final concentrate with a significantly reduced sulfur content. Iron production generally follows a fixed process chain. 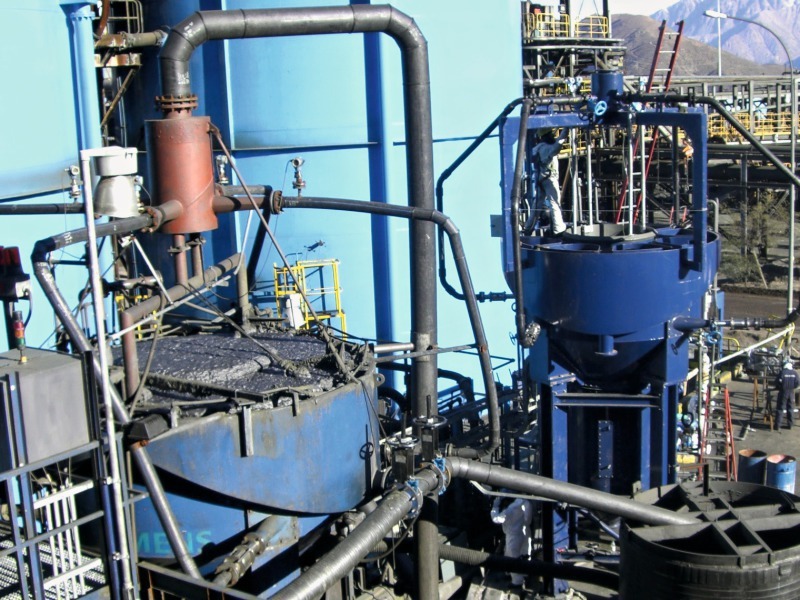 Ore extraction in the mine is followed by the downstream processes of beneficiation, pelletizing or sintering, followed by the blast furnace or direct reduction process (Fig. 1). In the beneficiation system, the flotation is a sorting process that assures achievement of the mineral contents necessary for the downstream processes. Each of the downstream processes imposes different requirements on the particular feed material, such as the concentrate, the pellets, etc. The sulfur content in the feed material is process-related and is specially regulated by environmental legislation. The literature does not specify concrete sulfur limits for pelletizing. However, the pelletizing process is decisively dependent on recirculation of the process gases between the different zones of the process. 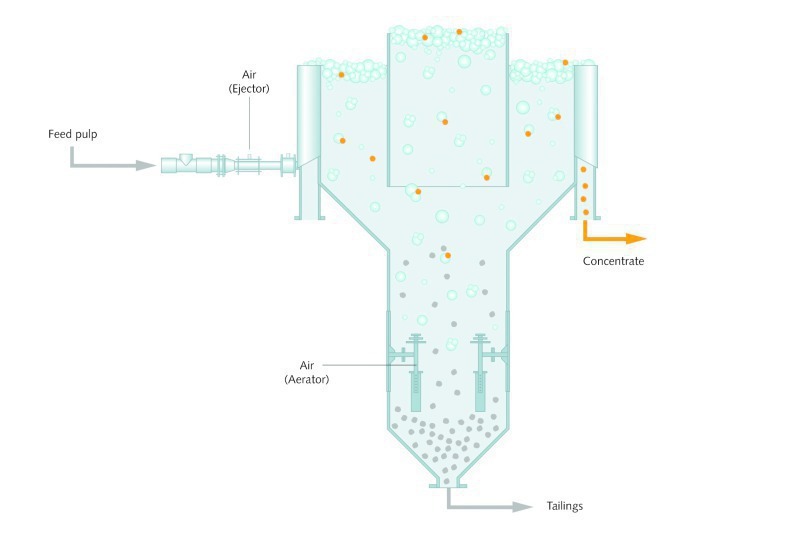 In order to prevent sulfur recirculation with a consequent enrichment of sulfur in the process gas, the sulfur-carrying gas is usually discharged through chimneys at the optimum point of the process. The temperature range of the sulfur oxidation determines the position of the exhaust air duct in the pelletizing process. If the sulfur is present in different compounds in the feed material, the oxidation temperatures of those sulfur compounds can differ. This has the consequence that the pelleting process gains in complexity and can thus become uneconomical. ​The demands on the sulfur content of the feed material for the sintering process arise due to environmental protection regulations. These set limit values for sulfur in the exhaust gases, which must not be exceeded. The sulfur content of the iron ore feed material does not have a negative effect on the sintering process. However, the amount of sulfur in the exhaust gas is directly affected by the sulfur content of the iron ore feed material, even though the bulk of the sulfur is introduced in the coke. For the blast furnace process, the usual sulfur limit is 0.08 % . Higher sulfur contents in the feed material also increase the sulfur loading of the blast furnace, which requires a higher addition of MgO and CaO for the desulfurization. However, this results in increases in the volume of slag and the coke rate, which force up the costs for desulphurization . Too high a sulfur load in the blast furnace can lead to a reduced pig iron quality. Similar to the sintering process, approximately 70 % of the sulfur is introduced via the coke. 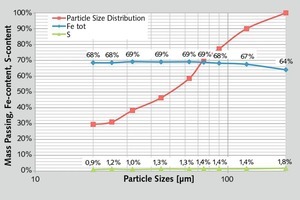 Nevertheless, even though the amount of sulfur introduced in the iron carrier material is relatively small, it directly affects the pig iron quality. For the Midrex technology as a representative of direct reduction, the requirements for the feed material are known. These stipulate a maximum sulfur content of only 0.008 % in the pellets . The limiting factor here is the nickel catalyzer, which is damaged if the sulfur content is too high. Sulfur dioxide, which is generated by the thermal processes of iron production, is a major cause of acid rain. The emissions from the iron and steel industry of China alone reached 1.76 million t in 2010, underlining the need for environmental regulations . Due to the described processes and the existing environmental regulations, the sulfur has to be removed. There are two possibilities for doing this: One is to desulfurize the exhaust gas from the thermal processes. The other is to reduce the sulfur content via the iron ore beneficiation process. As a sorting process, flotation plays a fundamental role in this. The objective of the test campaign described below was to reduce the sulfur content in an iron ore concentrate from 1.3 % to less than 0.4 %. The concentrate would thus fulfill the process and environmental requirements with regard to the downstream pelletizing plant. The stipulated recovery rate of iron was 95 % or higher. 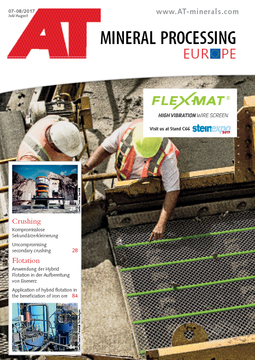 Hybrid Flotation technology combines the pneumatic ­flotation principle with the principle of a flotation column (Fig. 2). One of the main features of pneumatic flotation is that the bubble-particle contact takes place outside the actual flotation tank. According to this definition, Hybrid Flotation technology can be regarded as a type of pneumatic flotation. The Hybrid Flotation cells are designed such that the feed slurry first flows through the pneumatic section and then enters the flotation column section. 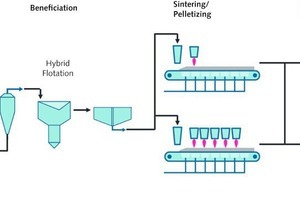 This process addresses the challenges arising from increasingly finer particle classes and lower raw material contents (Fig. 3). A significant difference between the Primetals Hybrid Flotation system and conventional flotation cells is the mixture of the feed slurry with the flotation gas. In the Hybrid Flotation technology, the slurry and the gas are mixed in the chambers of the Ejector before the mixture is injected into the flotation cell. In the pneumatic section, turbulent flows possessing a high kinetic energy are generated. These ensure the generation of small gas bubbles of a desired size. On the one hand, this increases the contact rate between bubbles and very fine particles of feed material, and on the other hand it improves the adhesion of the particles to the gas bubbles. This enables the pneumatic section to float particularly fine and ultra-fine particles. 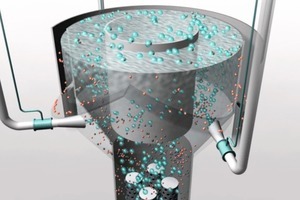 Particles of valuable substance which have not come into contact with a gas bubble within the pneumatic section sink down the Hybrid Flotation cell together with the gangue and enter the section of the flotation column. A second aerator unit at the bottom of the flotation column injects flotation gas into the slurry. The sunken particles are thus carried to a second flotation stage in the column. Despite having two flotation stages, the Hybrid Flotation system achieves retention times of 3 minutes. 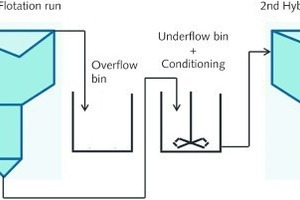 The principles of Hybrid Flotation cells are the same in both laboratory scale and industrial scale systems. 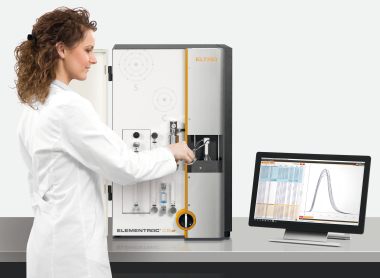 Just like in industrial systems, the laboratory cells of the Hybrid Flotation system are operated continuously and show a stable flotation process throughout the test period. The holistic characterization of the feed material comprised a chemical analysis, a screen metal analysis and a microscopic and mineralogical analysis. The chemical analysis of the feed material showed an iron content of 67 % and a sulfur content of 1.3 %. 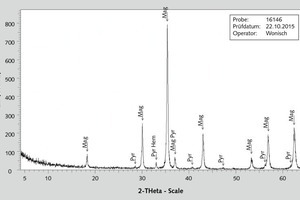 The detailed results of the analysis are shown in Table 1. The feed material mainly contained iron-carrying minerals, which is indicated by the high iron content of 66.95 %. The most important gangue elements were magnesium, silicon, calcium and sulfur. 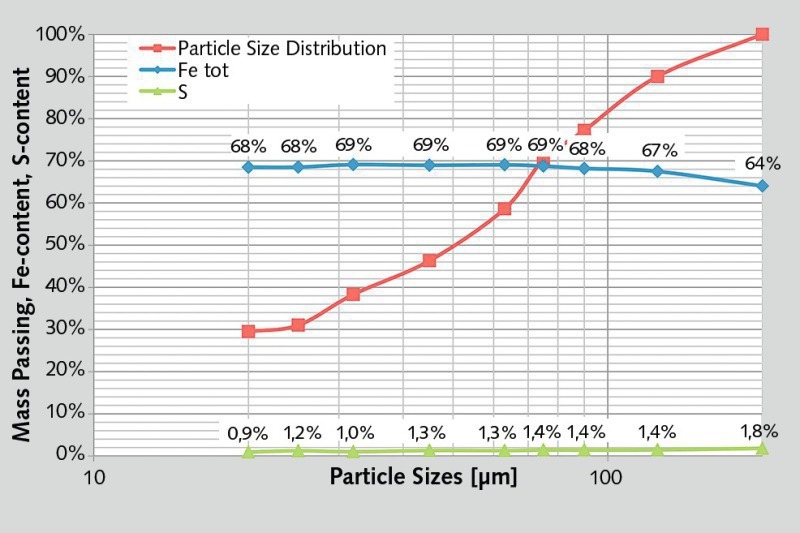 The screen metal analysis shows the particle distribution as well as the distribution of iron and sulfur contents over the fractions (Fig. 4). The results show that 50 % of the mass was smaller than 50 μm and 90 % was already smaller than 125 μm. In addition, it can be seen that the sulfur was distributed over all particle size fractions. A slight upward trend of the sulfur content can be seen as the size fractions increase. On the other hand, the iron content decreases slightly with increasing size fractions. 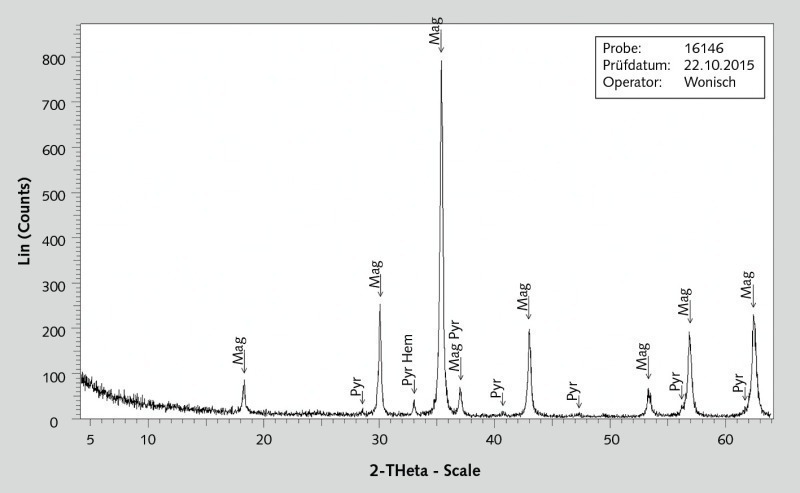 The mineralogical analysis was performed by means of X-ray diffractometry. Fig. 5 shows the results for the main minerals magnetite, hematite and pyrite. An examination of the iron content of the chemical analysis produced the distribution of the main minerals shown in Table 2. The degree of liberation was examined by means of microscopic analysis. This showed that between 85 % and 90 % of the magnetite, hematite and pyrite particles of the <125 μm fraction were completely liberated. Individual adhesions existed between magnetite and pyrite, and between magnetite and hematite. The fraction >125 μm showed a liberation rate of 85 %. 1. The best composition of the reagents for floatation of the sulfur. 2. A benchmark for assessing the performance of the Hybrid Flotation cell. A total of 16 pre-tests were carried out. For each pre-test, approximately 1 kg of feed material was used. Initially, the surfaces of the material were cleaned and activated in an attrition cell. The solids content was adjusted to 30 wt % for all the pre-tests. Only the flotation regime was varied. Table 3 shows the flotation regimes of each individual pre-test. Conditioning was carried out by the addition of collector every 2 minutes. The frother was added only once just before the start of the pre-test. The pH-value was adjusted to the desired value by means of a regulator. In addition, Table 3 shows the achieved sulfur contents in the iron ore concentrate after the flotation test and the mass recovery (yield) of each pre-test. The results vary greatly in both mass recovery and sulfur content. The mass recovery was in the range of 85.4 % to 97.6 %. The sulfur content was between 0.26 % and 0.91 %. The best sulfur content result was obtained with collector C and a concentration of 250 g/t and with frother A and a concentration of 50 g/t. In addition, the mass recovery was very high. At the beginning of the test, the pH-value was adjusted to 8 by means of NaOH. The conditioning with collector D produced an average performance. The resultant sulfur content was higher than that of the best pre-test, but the mass recovery was very good. Tests #15 and #16 differ only in the application of regulator. The result which was achieved without admixture of the regulator H2SO4 was slightly better than the result of the test with the regulator. The worst sulfur contents resulted from use of collector A in conjunction with frother A. 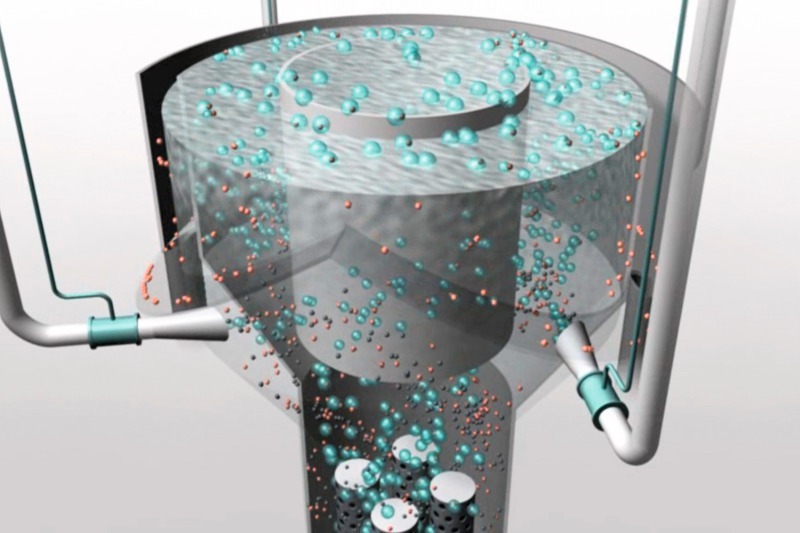 The highest mass loss was observed when using collector B in combination with frother A. The Hybrid Flotation tests were carried out with the flotation regimes which had proved successful in the conventional pre-tests. Two flotation regimes were selected for this purpose (Table 4) due to their sulfur content and mass recovery. The iron ore concentrate of the first flotation cycle corresponded to the new feed material of the second cycle and was collected in a bin. In this bin between the two cycles, post-conditioning was carried out with one addition of collector. The sulfur-bearing pyrite was directly floated and collected in an overflow bin. The final concentrate was collected in a further bin. In each of the Hybrid Flotation tests approximately 90 kg of feed material was used and adjusted to a solids content of 30 wt %. The contents produced are shown in Table 5. In the first flotation test, in which collector C was used, a final concentrate with a sulfur content of 0.31 % was obtained. However, in the second Hybrid Flotation test using collector D, the sulfur content obtained in the final concentrate was substantially worse, at 0.75 %. 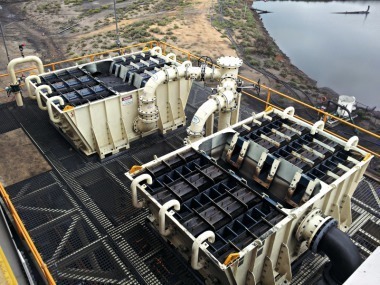 The test campaign was carried out with the aim of floating the sulfur out of the iron ore concentrate. The sulfur content of the feed material was 1.3 %. The target was a reduction to less than 0.4 %, with the Fe output being at least 95 %. It was shown in the test campaign that Hybrid Flotation technology successfully reduced the sulfur content. The best result of the campaign was achieved with the first Hybrid Flotation test, which produced a sulfur content of 0.31 % associated with a 96 % Fe output. This result represents an overachievement of the targets for the test campaign. The second Hybrid Flotation test only reduced the sulfur content to 0.75 %. Nevertheless, the Fe-recovery was 97.9 % and the mass recovery of 97.36 % was somewhat higher than the result of the first test. For comparison with the conventional pre-tests, Table 7 presents the characteristic data of the best tests of both technologies. The performance of the Hybrid Flotation technology reached the values of conventional laboratory flotation. Classification of the results must take into account the fact that the dimensions of the Hybrid Flotation tests were significantly larger than those of the conventional tests. In addition, the tests using Hybrid Flotation technology were run as a continuous process, which underlines the outstanding performance of the technology as a pneumatic flotation process for reducing the sulfur content in an iron ore concentrate. The test campaign proved that Hybrid Flotation technology is an effective way of lowering the sulfur content. 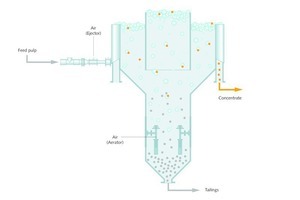 A reduction of the sulfur content to 0.31 % means that the produced concentrate meets the process and environmental requirements of a pelletizing plant. Further tests will enable the amount of the used flotation reagents to be optimized and will also allow further reagents to be tested. In addition, the effects of an increase in the solids content can then be checked. 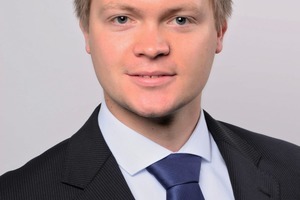 Lukas Petzold studierte bis 2014 Wirtschaftsingenieurwesen an der Bergakademie Freiberg. 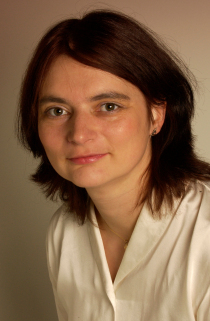 Dabei setzte er seinen Schwerpunkt im Bereich der Aufbereitungs­maschinen. 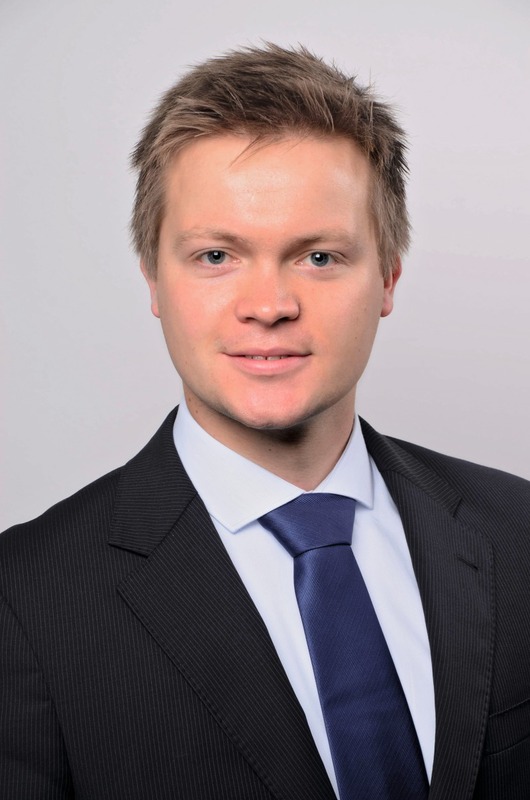 Parallel zur universitären Ausbildung arbeitete er in Südafrika und bei ThyssenKrupp Polysius USA im Mineral Processing. In seiner Masterarbeit befasste er sich für Siemens mit der Skalierung der Hybrid Flotation Technology und arbeitete schließlich nach dem Studium für die Erzaufbereitung bei Siemens VAI, heute Primetals Technologies. Zu seinen Aufgaben gehören die vollständige technologische Betreuung der Hybrid Flotation Technology sowie die Prozes­s-auslegungen ganzheitlicher Aufbereitungsanlagen.